For some crazy reason I thought this was seriously a non-fiction book. It’s not. 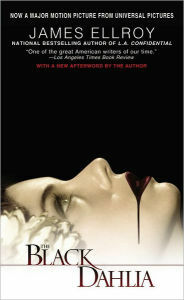 It builds off of facts of the real case about Elizabeth Short and it adds in a noir-style detective story. Bucky Bleichert and Lee Blanchard are warrants detectives in the LAPD and former boxers. They have a pretty good thing going on as warrants detectives. They’re in with the higher ups and in their spare time they go on re-po jobs and make some extra cash. But, then Elizabeth Short, the Black Dahlia, is found murdered and mutilated in a field on their beat and their story because focused on finding Short’s killer. As they dig deeper into the case, their own secrets start to come out and their professional and personal lives begin to crash. Can they solve Short’s murders? Can they save their own careers? This was a dark novel but it was well written and I enjoyed it. If you’re interested in period pieces set in the 1940s, detective stories or sensationalized murders, you may want to check this one out. This entry was posted in reviews and tagged Black Dahlia, Detective Fiction, James Ellroy, Noir by Kate. Bookmark the permalink.